The word “laser” is an acronym for Light Amplification by Stimulated Emission of Radiation. A laser is a concentrated beam of light, created when an electrical current passes through a special material. Used in eye surgery since the 1970s, the laser is popular for its unparalleled degree of precision and predictability. 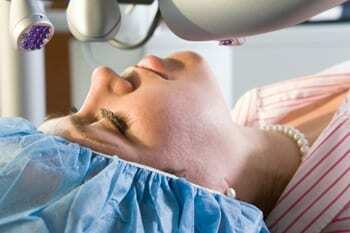 Lasers are being used for an increasing variety of eye diseases. Thermal lasers convert light to heat. This type of laser seals blood vessels and destroys abnormal tissues. Photodisruptive lasers cut or sculpt tissue and are used to remove tissue, changing the shape and surface of the eye. Thermal lasers are used in the treatment of retinal tears and holes. If found before the retina detaches, the laser helps prevent detachment by bonding the retina to the wall of the eye. If retinal detachment has occurred, laser is often used as part of the surgical repair of the detachment. Thermal lasers can preserve vision, sometimes for many years, for diabetics with diabetic retinopathy. In treating diabetic retinopathy, the laser light seals leaking blood vessels in the retina, the light-sensitive layer of cells lining the back of the eye. Laser surgery in diabetics also slows or stops growth of abnormal blood vessels, decreasing the chance of bleeding in the eye. Lasers also treat more unusual retinal disorders, including blood vessel problems and tumors. Lasers can be used to treat glaucoma in two ways. First, photodisruptive lasers can create a new passage through the iris to relieve eye pressure associated with narrow angle glaucoma. Secondly, glaucoma laser surgery can stretch open they eye’s blocked drainage canals which can lower eye pressure in open angle glaucoma. 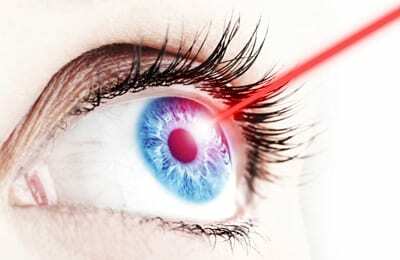 Although lasers do not remove cataracts, they may one day. Right now, photodisruptive lasers can open the posterior capsule located behind the new plastic lens implant. This membrane often becomes cloudy after cataract surgery, but when removed can restore vision in a matter of hours. More recently, the excimer photodisruptive laser has received a great deal of attention as a tool for permanently correcting refractive errors such as nearsightedness, farsightedness, and astigmatism. Refractive laser surgery through Lasik and PRK can decrease or eliminate the need for glasses and contact lenses by reshaping the cornea.